The job of gunsmith might sometimes be seen as rather old-fashioned, kind of like a blacksmith. Some people don’t even think the job still exists. But for firearm enthusiasts, it is a very important and necessary part of repairing or customizing guns. Ken Lenz of Firemaster’s Firearms in Cinebar explains all that he does during the work day. Lenz originally planned to simply support his son in his career choice. His son went to a gunsmith school at the Colorado School of Trades and they then opened the business in Cinebar together. 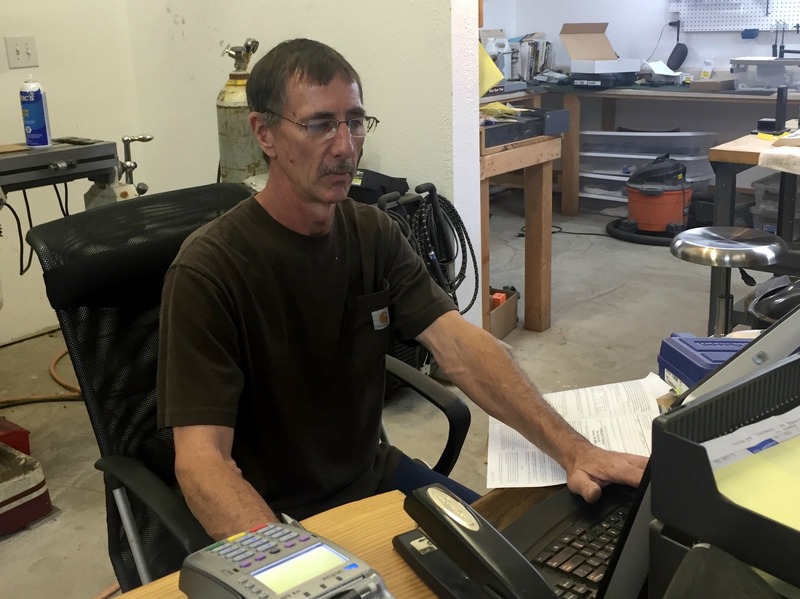 Lenz had experience running a small business so he ran the business side while his son ran the gunsmithing side. “We trained each other in both directions,” Lenz says. After several years, his son decided to leave the business, but Lenz enjoyed it so much that he decided to keep doing it. The work has increased enough now that there are four people on the team at Firemaster’s Firearms. While one may think he spends his entire day working on guns, it’s a good thing Lenz likes the small business side. “Some days there is almost more book work than gun work,” he says. Plus the work involved with guns isn’t only about repairing them. A typical day can include a variety of activities. The day I spoke with Lenz, he had just got off the phone with someone who wanted a special order. Lenz had to call the company to order everything, then call the customer back to confirm. “It’s a lot of phone time and computer time,” Lenz explains. After he finished that task, he re-assembled a rifle that he had threaded for a muzzle break. “A lot of hunters have muzzle breaks put on to help reduce the recoil,” Lenz explains. Then he had more phone calls, and did more paperwork. After that was finished, he was able to do more fun stuff like put a new trigger on another rifle. Firemaster’s Firearms is also the contact for the local Friends of the NRA. As part of that, he receives the shipments of firearms that are raffled off for their fundraisers, which support groups like the Centralia and Chehalis high school rifle teams. “It’s always fun to see what will be in the box when I open it,” Lenz says. 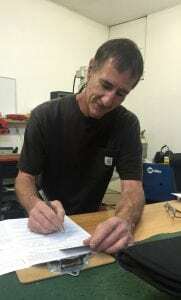 One of the major tasks Lenz has to do is whenever someone purchases a firearm from Lenz, he has to complete paperwork. All buyers must fill out the federal background check, known as NICS, or National Instant Criminal Back Check. After the customer fills out the paper form, Lenz has to enter it into the federal computer system to be approved. “At least it’s faster than when we had to call it in,” Lenz says with a smile. If a person is buying a pistol, Lenz must also complete state forms, which actually takes even more time and are more cumbersome. The job can also include teaching others about the career. 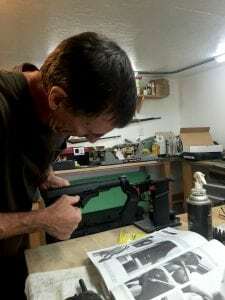 Lenz says that anyone who is interested in becoming a gunsmith should spend time with one to find out all the intricacies. “We’ve had a couple of high school students, and others, come to us for a job shadow. I can walk them through the business aspect of it too, so they’ll know what it takes in the way of paperwork and equipment,” Lenz explains. In addition to the usual business licenses, a person starting a gunsmith occupation has to get a Federal Firearms License commonly known as an FFL. Finally, the biggest investment is the substantial investment for the tools and equipment. “It’s fun work, though. We always find guns we have never seen before, especially old guns. And we keep busy. We aim to have a fast turn-around, but we always have projects to do,” Lenz says. Because business has increased so much, Firemaster’s Firearms will be expanding, using the current site for the work shop and adding a larger building for retail. “People are always surprised at the amount of inventory offer,” he adds.